Hurry Up Summer: I’m Hungry for BURGERS! I can’t take credit for today’s post at all. I had a REALLY long day starting at 5 a.m. last Friday and didn’t get home until 8:30 p.m. I had asked/demanded that Branden prepare dinner before I got home so I could just relax after my day upon arrival. He’s a really good cook and his dinner he came up with didn’t disappoint at all! We are both incredibly ready for warm weather and all that comes with it- grilling, summer veggies and fresh herbs, eating outside, and fires in the back yard. Seriously, I can’t wait and Friday’s dinner didn’t help me with my patience. About a month or so ago, we got a Williams-Sonoma catalogue in the mail that had an absolutely incredible looking stuffed burger on the front. My mouth was watering and we’ve been dying to try it. Branden was able to track down the recipe and ended up making his own creation based off the original. Our burgers were accompanied by grilled green onions and asparagus and roasted sweet potato fries (a weakness of mine, especially with some homemade aioli!). I’ll start with the sides first before I move on to the burgers. We love grilled veggies. Quite frankly, my favorite way to make asparagus is on the grill- I just love the little bit of char that forms on the spears. I also really like the fact that its pretty hard to make asparagus mushy on the grill. I like my veggies crunchy, so grilling (or broiling in the winter) is my cooking method of choice. Toss in some fresh garlic, sea salt, fresh cracked pepper, and olive oil and you’re good to go. I’ve been known to grill a whole bundle of asparagus and eat the entire thing myself– no fork needed! This method also works wonders on green onions that almost turn sweet on the grill (a perfect way to use those leftover onions in the crisper that often go to waste). Now for the burgers. Yum. Branden mixed his 80/20 ground beef with chili powder, cayenne, cumin, white pepper, fresh cracked black pepper, minced roasted garlic (from a jar), and Worcestershire sauce. I wish I could give you exact measurements, but he kind of threw things in as he went (and did a wonderful job, I might add!). The original recipe called for stuffing the burgers with pepper jack cheese, but we had an “incident” last summer with stuffed burgers, so Branden decided to play it safe and melt the cheese on top. And for the fixin’s! Branden grilled fresh kaiser rolls from the bakery that were rubbed with a bit of olive oil to make them toast up nice. He also grilled fresh red onions. And if it couldn’t get any better, he fried thick-cut peppered bacon until crisp. And even better yet was the avocado mash! 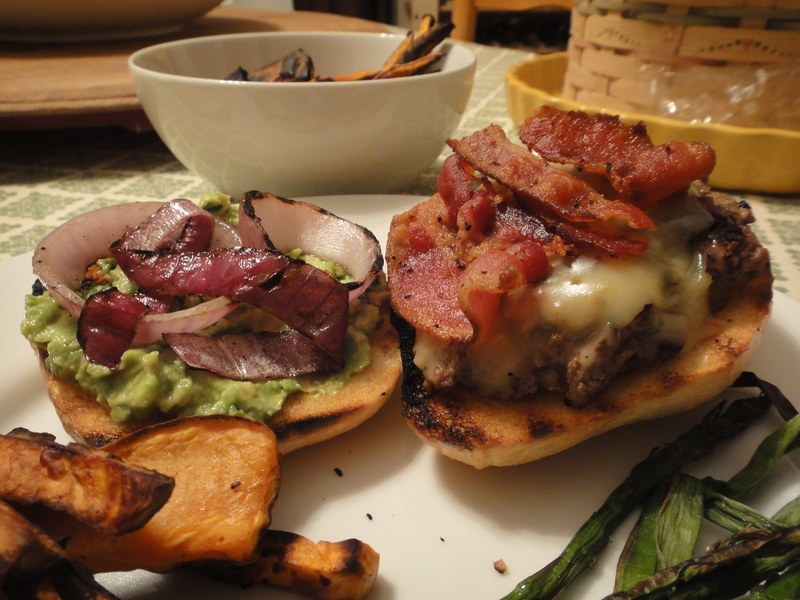 The combination of the heat of the burger seasonings and pepper jack cheese with the cool avocado, salty bacon, and sweet grilled onions was bliss in my mouth! I instantly was reminded why I yearned for summer and the opportunity to create magic on the grill. These burgers were amazing. I know that it helps that my husband knows his way around a grill, but the unbeatable flavor combination here helped knock this burger out of the park. We will definitely be making these again and will probably have to have some friends over to enjoy as well because they’re too good to keep to ourselves! In a bowl, combine the avocados and lime juice and mash them together with a fork. Season with salt and stir in the cilantro.